Free up room on your desk space with the cleverly-designed VonHaus height adjustable smart stand with integrated drawer - ideal for monitors, TVs, laptops, tablets and printers. A compact unit, the smart stand with drawer offers a handy way to add extra storage to your working area and a smart way to organise all of your office essentials. Anti-skid EVA foam feet protect your work surface from scratches and scuffs as well as keeping the lightweight stand firmly in place. The drawer offers a handy space to store your stationery and, with optional dividers, you can choose if you want to add inner compartments to the drawer. Meanwhile, the in-built cable management systems keeps cables organised and out of the way. Handy grooves line the front and sides of the stand – an ideal storing place for pens, paper clips and other stationery items. 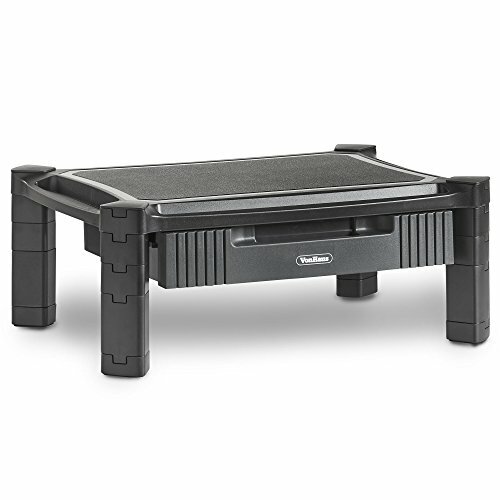 ADJUSTABLE HEIGHT: Smart stand with drawer for storage as well as incremental leg risers for best viewing position and to help to reduce any strain on back and neck muscles. LIGHTWEIGHT DESIGN WITH STORAGE SHELF - side grooves around the edges for pens and pencils. Store other office equipment with pull out shelf and create a clutter free desk for a better and more efficient working environment.